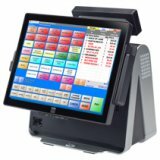 Cash Register Express (CRE) and Restaurant Pro Express (RPE) are retail point of sale (POS) systems that helps increase efficiency and accuracy, lower operating costs, and helps you manage your inventory. The easy to use POS includes the features most desired by retailers, such as inventory tracking, credit card processing, cash management, customer loyalty, employee time clock and labor scheduling, and a detailed reporting interface to help them make smarter business decisions. Watch the LIVE DEMO HERE! The Cash Register Express & Restaurant Pro Express POS solution is scalable for many types of retail stores, single or multi-site. Accurate and robust inventory control is a key component of a retail stores profit margins and overall success. The inventory tracking capabilities within Cash Register Express detail which products are selling, what needs to be reordered and identifies items that have been stolen or are otherwise missing. The integrated purchasing functionality is used to track vendor lists, manage item costs and generate and receive purchase orders. Stock can be counted or received away from the register using the integrated Pocket Inventory software on a handheld computer. Good service and quality products are key components of generating new and repeat business, however, those two elements alone will not ensure success. Cash Register Express helps you answer the question of What next? after selling to a customer. Solid marketing and a loyalty rewards program are proven methods of attracting new and existing customers into your store. The system puts several tools in your hands to help you accomplish this including automated tracking of loyalty plans and tools to market directly to your customers. Employee theft is one of the leading causes of retail shrink, caused by a combination of theft of cash and inventory, as well as unwarranted discounts. Cash Register Express includes multiple theft prevention features that introduce accountability to your employees. System functions such as discounts, no-sales, voids, and price changes can be accessed or restricted based on an employees unique login ID or job code. Various reports can be generated on this activity to identify potential theft or wrongdoing. Strict cash control features can be used to identify cash discrepancies down to the shift or the cashier. A camera security system can be connected to your point of sale system to further enhance the accountability of your employees and security of your store. Retailers spend countless hours calculating profits, expenses and payroll and performing a variety of manual tasks in order to run their business. Cash Register Express contains dozens of built-in tools to help retailers streamline administrative tasks and manage their retail stores more efficiently. Labor is typically the largest expense in a retail store outside the cost of the products being sold. Cash Register Express has integrated time-clock and labor scheduling functionality to help you manage staffing and reduce labor costs. Below are the minimum and recommended specifications for pcAmerica's POS software. If you have any questions regarding these requirements, please feel free to contact us.